Enjoy Life In The Moment is the Real Luxury in life. Portico , a place that is very well-known for its extreme creative and innovative dishes , has once again won the customer’s heart by launching their new high tea set from 15 March 2016 onwards. My first impression when I reached there – WOW. 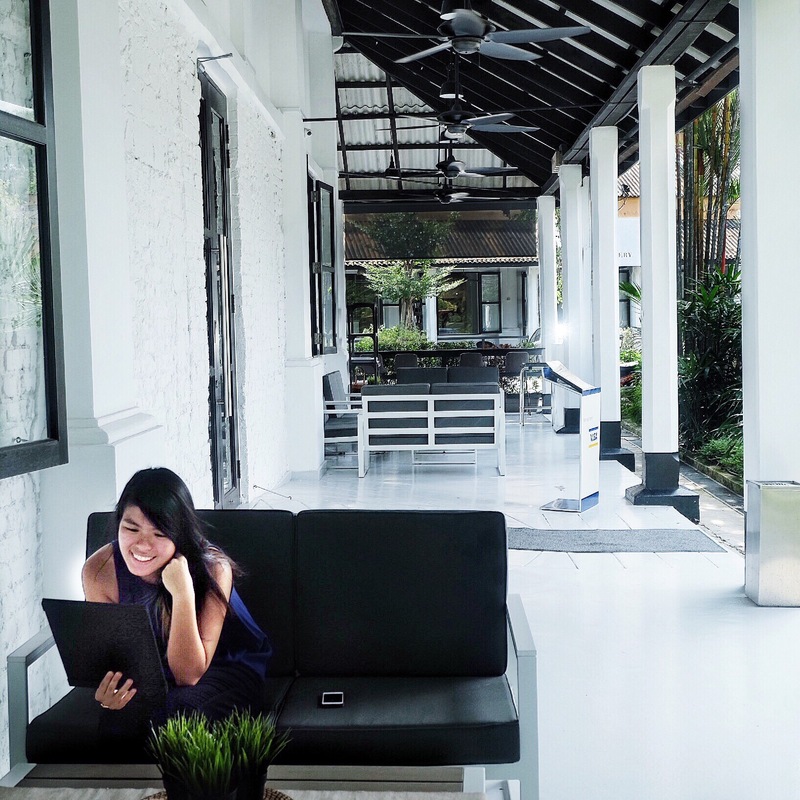 A very spacious dining place even at the exterior, a perfect place to indulge food while chit chatting. To ensure finest quality, Portico plants their own flowers to be used for decorative purposes. The kitchen area of portico. By reservation only. Call 91141926 now! Limited to 30 sets, available Tues- Sun, 3-5pm. We kickstarted our high tea session with this aesthetically appetizing dish. I love the strong truffle taste of the angel hair pasta and its something which I would definitely return for. Prawn skewer is probably normal to you , but how about a thin layer of melon sheet around it . It gives you a very refreshing taste , and together with tobiko roe that gives you a final touch of flavor, color and crunch, this dish is perfect. Afraid that the pastries may just drop off from your hand like how you play Uno stacko? 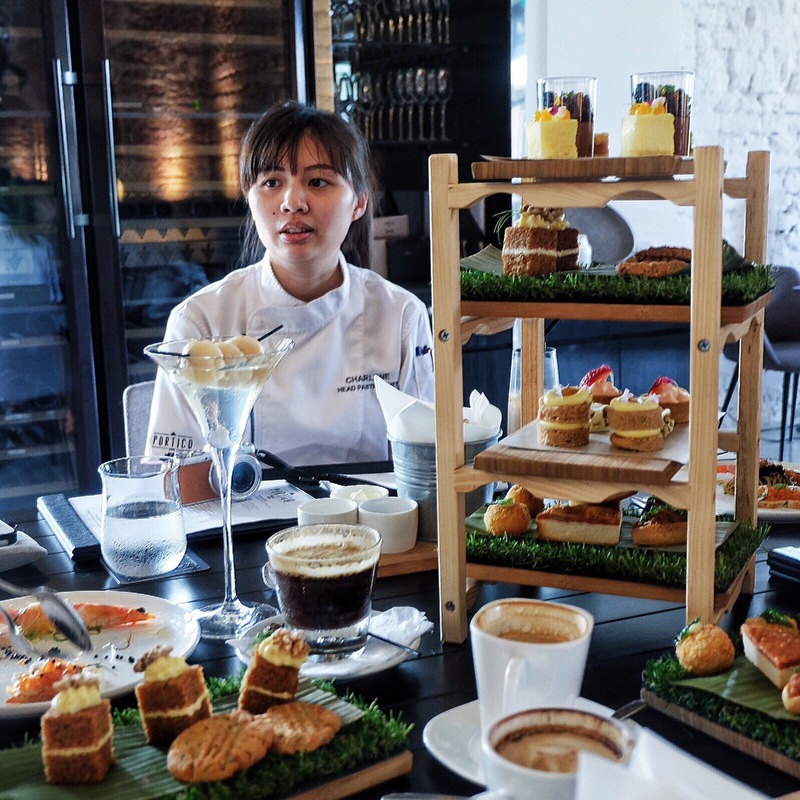 The thoughtful head pastry chef Charlene designed the tea set rack in a way that it can be dismantled into 4 parts to make it easy and convenient for the customers. How creative she is right?! Thumbs up! For those crab lovers yet find it messy to eat it, good news for you! Mess- free and all you need is to put everything in your mouth! Very generous amount of chili crab meat filled in soft eclairs and trust me, you would love this! A very aromatic blend of fresh fish paste and spices. It would be perfect if the toast is not that thick. Still, worth the calories! Eat it hot and experience a burst of salted egg sauce when you put everything into your mouth. Yummy! Very rich peanut butter taste and I was holding this cookie while having a photo shoot and it just went into my tummy in no time. I am not a fan of carrot cake, but yes I am in love with this carrot cake. Very soft and perfectly-spiced with the right amount of moist in it . Cream cheese was light and it went very well with the carrot cake! I love this the most among the pastries ! The bandung rose cream was light yet quality of the tart was not compromised. Eat together with lychee and strawberry, it gives you a refreshing taste and not jelat after some time. Pistachio Nut was crunchy and I always think that Pistachio and white chocolate are heavenly matched. That was my first time trying this soft marsala-spiced Chai Tea cake with light honey ginger cream and orange confit. The tea cake was nicely spiced at the right level and the light honey ginger cream just further enhanced the distinct flavor of marsala chai tea cake. The crumble was buttery but it was a little too soft. Nonetheless, the idea of topping up with sweet basil cream is pretty creative! Who says blackforest must be in a form of cake? If you are a chocolate lover, you would love this. Yes. You are right. She is the one who came out with this idea- Charlene Ng, the head pastry chef. She is a friendly and nice lady who patiently explained individual dish that day. You can feel her passion in bakings /cookings and this is how she create happiness in people. Do support her!